Coins, medals and bank notes are important testimonies to history. As one of the oldest and most prominent collections of its kind, the Münzkabinett is a museum of European stature. The collection comprises some 300,000 objects ranging from antiquity to the present day – everything from coins, medals, decorations, banknotes, historical bonds and coin and medal dies to minting machinery and equipment. 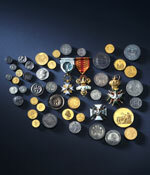 One important focus is the collection of Saxon coins and medals, which vividly reflect the history of Saxony. The permanent exhibition has been on view in the Georgenbau of the Royal Castle since June 2015. The library and study hall are accessible for use. Tram and bus lines to "Postplatz"